The first part of the European leg of our year was in the Czech Republic. 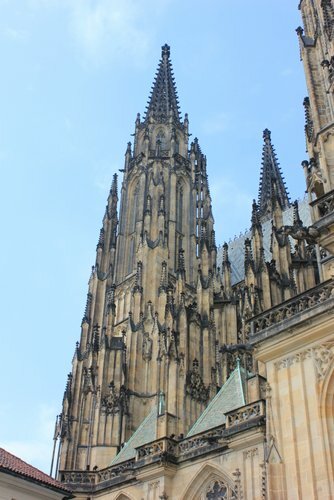 The main portion of this trip is a five-week stay in Vienna, but we wanted to add on a bit of other travel before and after, and Prague seemed like a great place to start. Not only is it a great travel destination and much cheaper than Western Europe, some of Bowen’s ancestors came from the Czech Republic, so it was an opportunity to visit “her people”. 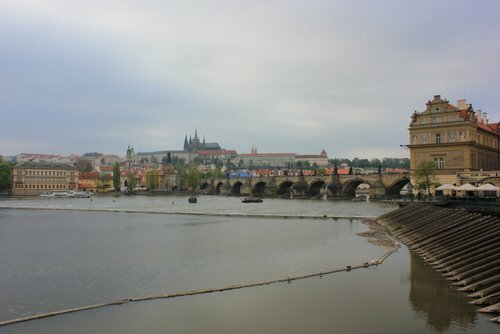 We arrived in Prague after a grueling 20 hours of travel from Portland via Dallas and London, and caught a bus to a subway to a bus, which was quite easy and cost us less than $2 per person. We had found a hotel about 3 miles south of the center in a lovely little residential neighborhood. We got settled in our hotel, rested a bit and then took the tram into the center to wander a bit. 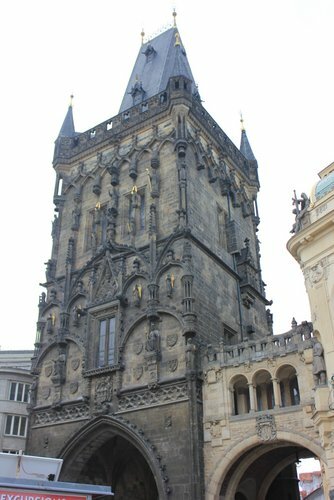 We got off at the Charles Bridge (Karluv Most), walked out along the bridge a bit to get the lay of the land, and wandered through the old town, into the new town, soaking up the sights and architecture. We decided to have dinner back in our neighborhood, but stopped into a pub for our first Czech beers. 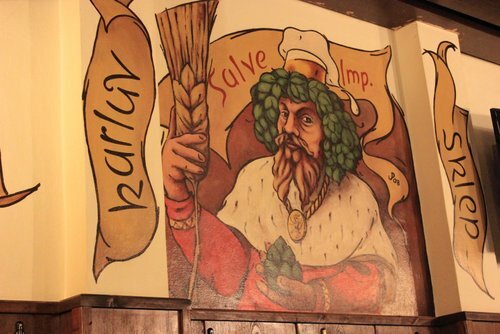 A few words about Czech beer. Delicious. Cheap. Light yet flavorful. In a word, awesome. In a year of lots of beer that was big on refreshment, but not on taste, Czech beer was a wonderful return to quality. And very different than high quality American beers, which all seem to be about out-hopping the next beer. 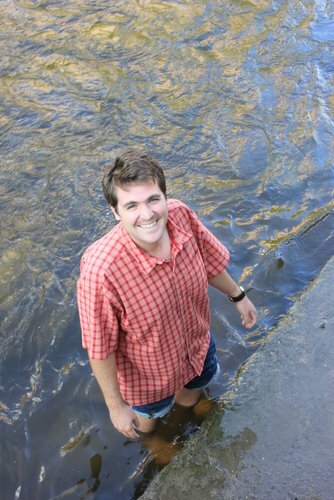 (We went to a bar recently that had a full page of beers on tap and about three quarters were either IPA, Double IPA or Triple IPA, and the balance were mostly Imperial Stouts or Belgians, leaving approximately two that weren’t intended as flavor bombs.) These beers were all about being delicious and reasonable and balanced and drinkable. 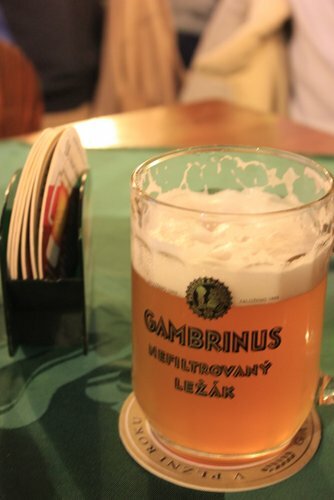 I love fizzy refreshing beer, and I love hoppy, flavor-intense beer, but the beer we drank in the Czech Republic was a welcome middle ground. …auspiciously overseen by Emperor Charles V.
Our first full day in Prague we headed after breakfast to the Little Quarter (Mala Strana) and the Castle Quarter, wandering up the hill past the beautiful old buildings and an old walled vineyard to great views of the city. 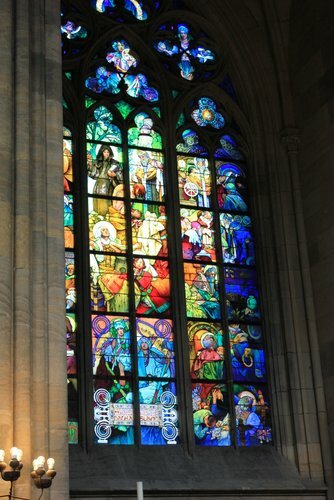 We visited St. Vitus cathedral and wandered a bit. 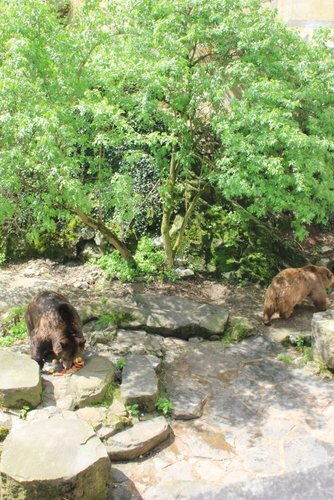 Then we walked back down again and through the Wallenstein Garden. 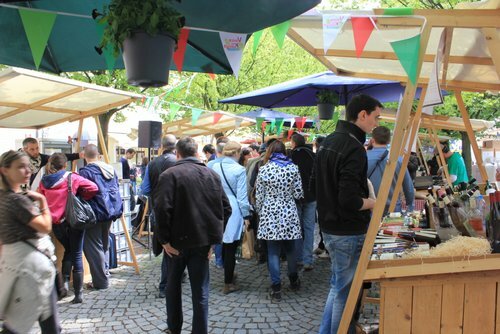 We stopped for a lunch of wine, cheese, sausage and bread at a little festival we found on Kampa Island. We wandered the island a bit, and visited the Infant Jesus of Prague in the Carmelite Church, a major focus of pilgrims and recipient of fancy clothes from all over the world. Then we walked through the town back to the tram and headed back to our hotel. 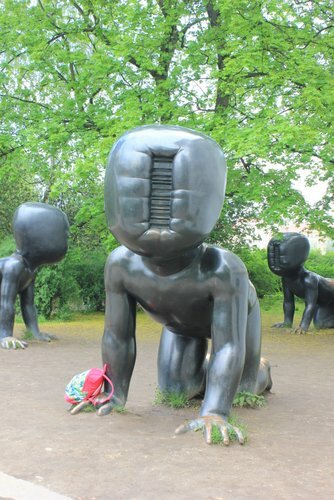 Creepy public baby art by David Cerny, the guy who did the creepy baby public art on the huge telecommunications tower in Prague. On our second full day we spent our time in the Old and New Towns. 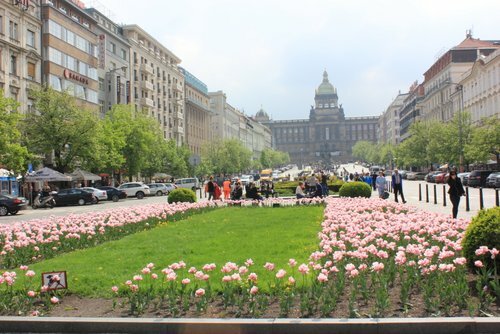 We started by wandering around Wenceslas Square (Vaclav Namesti), enjoying the beautiful architecture and pondering the historical events that occurred there over the past decades. 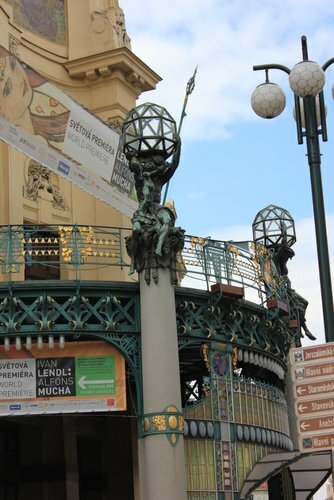 Then we headed to the Mucha Museum for some really incredible art. 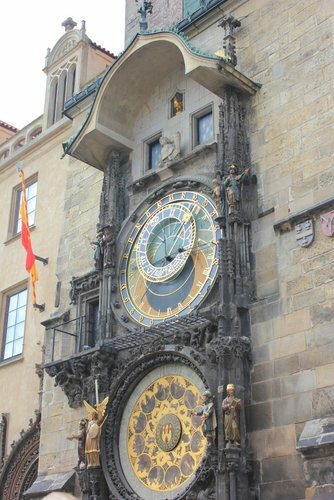 After lunch we wandered through to the gorgeous Municipal Hall, past the Powder Tower and over to Old Town Square, where we watched the Astronomical Clock chime. We were so taken by the art at the Mucha Museum and the discussion of the Slav Epic, that we hopped a tram out to the National Gallery to see the full Slav Epic in person. The Slav Epic is a series of 20 gigantic canvases (the smallest are about 13’x16’ and the largest are about 26’x20’) showing key moments in Slavic history. Seeing it was one of the best art experiences I have ever had, although I really wish I had a pamphlet or something to help explain each of the canvases. Then we stopped briefly through the Jewish Quarter and hopped on a nail-biting tram ride as our 90-minute transit tickets expired (we didn’t get caught). 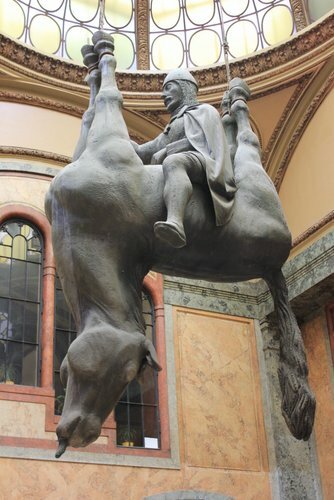 Much less creepy public art by David Cerny, featuring King Wenceslas riding an upside-down horse. 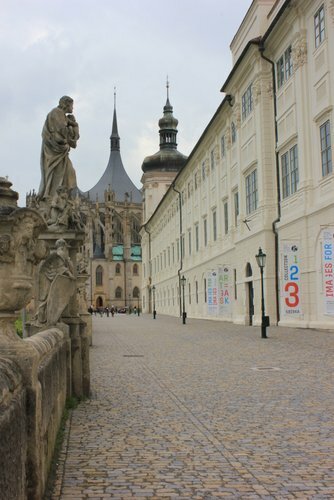 The next day we headed out to Kutna Hora ,about an hour outside of Prague. 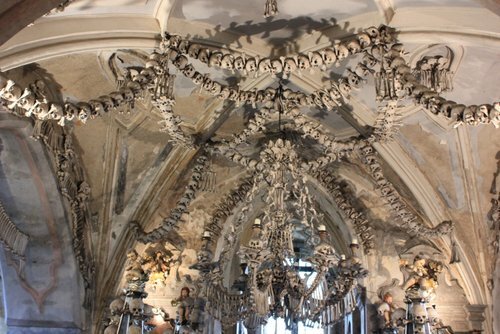 The main attraction is the Bone Church (the Sedlec Ossuary). 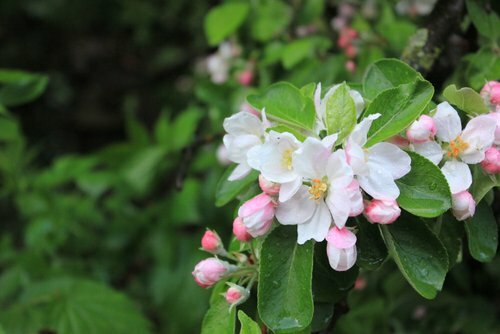 In the 13th century the abbot of the local monastery was sent on a trip to the Holy Land and brought back some soil, which he scattered around the cemetery. Thereafter, people from all over Central Europe wanted to be buried in the cemetery. Then the Plague and various wars came through, providing many more skeletons for the cemetery. A few hundred years later, a church was built on the site, and they built an ossuary underneath to house the exhumed bones. For whatever reason, they decided to decorate the ossuary with the bones, rather than simply stack them all together. 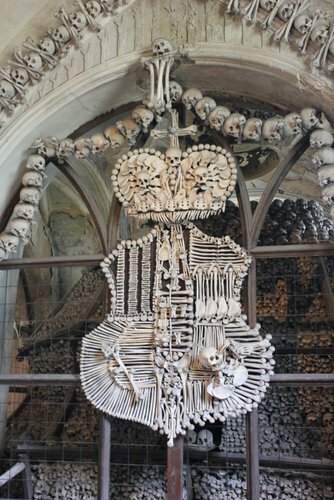 There were bone pyramids, a bone chandelier, a coat of arms of the local noble family made of bone, and even a signature by the architect made in bone. A bone coat of arms. Yes those are all actual human bones. After the church, we visited the nearby cathedral and then walked into the center of town, getting incredibly lost in our extreme hunger. We eventually found our way in, got lunch and then visited the beautiful Church of St. Barbara, dedicated to the patron saint of miners, and paid for by the vast wealth coming out of Kutna Hora’s silver mine, the largest in Central Europe. Probably the best word fro ice cream. 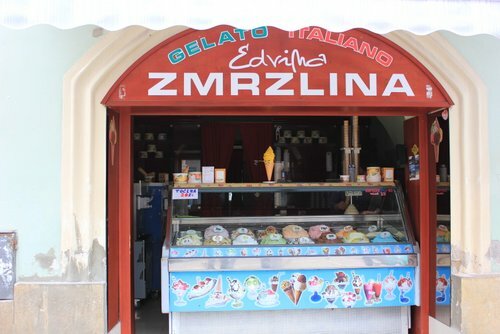 Also a great new word to indicate getting ice cream all over one’s face and similar situations of personal challenge. 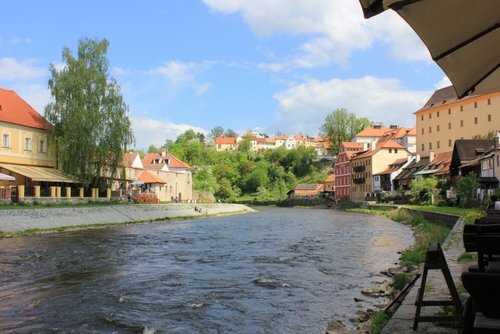 The next day we headed to Cesky Krumlov (prounounced chesky kroom-loff), a lovely little medieval town set in a crook in the Vltava River a few hours south of Prague. 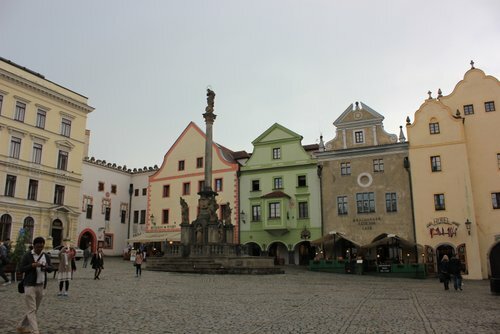 It was raining when we arrived, but the rain eventually cleared and we walked through the town a bit, enjoying the narrow, winding stone streets and views of the beautiful castle. 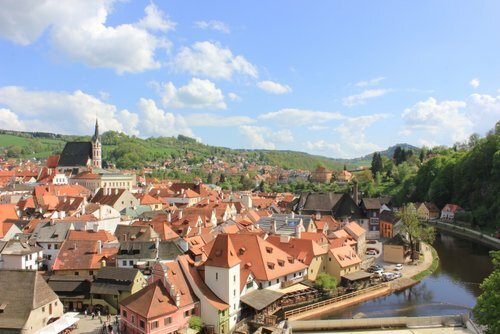 We had only one full day in Cesky Krumlov, and it ended up being beautiful. 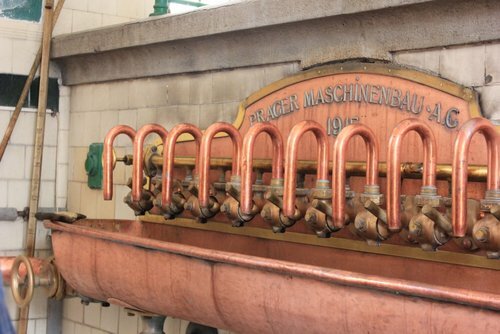 We wandered back to the castle in the morning to book a tour, and stopped into a few shops before going on a tour of the local Eggenberg brewery. The tour finished with half liters of Eggenberg beer with our tour mates. After the tour we ate lunch at the Tavern of the Two Marys, which focused on historically typical Bohemian food like barley, millet, buckwheat and herbs. 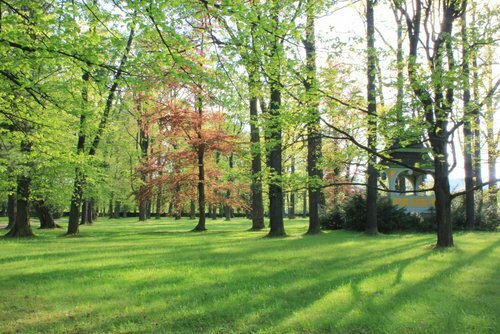 Then we headed to the castle gardens where we walked for a while, and then napped under a big oak tree with bright green new leaves. Our dinner reservation at Krcma v Satlaske (Satlavske Tavern) wasn’t until 8, we think because the guy taking our reservation was just a jerk, so we sat by the river enjoying the evening. 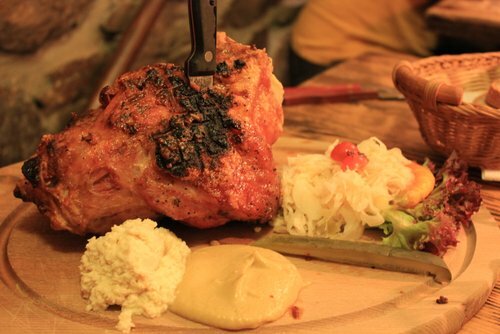 When we arrived at the restaurant, they had no record of our reservation, but lots of empty tables, so we settled in for a delicious medieval meal of half a roast chicken and a roast pork knee. Now that is a meal. The next morning we toured the castle. The only way to see the interior of the castle is on a tour and the tour in Czech was a lot cheaper, so we took that one and got an English information sheet. The castle was very cool, with lovely old rooms and paintings, a large gilded chariot that the family used while in Rome, and a ballroom painted with commedia dell’arte characters. (Unfortunately, no cameras allowed.) 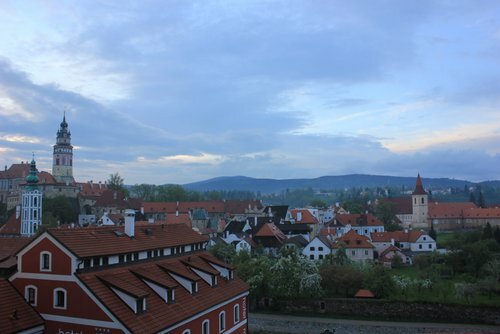 Then we headed back to our hostel and caught our shuttle through the Bohemian and Austrian countryside to Vienna.